The local Blue Haven Pools and Spas is a design focused, quality forward pool company serving the Raleigh and Greensboro areas. We custom design complete outdoor spaces with pools, spas, hardscaping, pool houses and everything outdoor living. Not only do our projects bring unmatched beauty and quality, but they are extremely efficient and easy to operate with any IOS, Android, or PC device. We stand behind our projects with the best warranty and service and offer no-contract custom maintenance plans. At Parrot Bay Pools and Spas of Fayetteville, NC we are proud to offer factory direct to you the finest fiberglass and concrete pools manufactured today. We have the experience, expertise, and know how to make your project a success. Allow us to transform your backyard into that dream vacation paradise for you to enjoy every day. Our dedicated crew has experience with every type of pool and terrain and can advise you on the best pool for your family and budget. Our team will help you choose a pool that suits your needs and customize it to compliment your home and your lifestyle. We want to be your pool contractor of choice! Clearwater Construction Group is an award-winning construction firm dedicated to bringing our clients projects that are tailored to their needs by creating an extension of the space in which they are intended to supplement. Our skilled team of designers, project managers, and craftsmen work hard to deliver the highest quality craftsmanship, while meeting our client’s goals and budgets. We specialize in custom swimming pools and spas, pool renovation, home renovation and remodeling, outdoor living spaces and commissioned art installations. We are dedicated to bringing homeowners and other contractors services that exceed expectations. Call us today to discuss your next project! We are the Master Pools Guild builder for Central NC. We are a full service outdoor construction company. We build custom concrete swimming pools, all of the surrounding hardscape features (including outdoor kitchens, fire pits/places, outdoor living structures), and install the landscape material (including irrigation, lighting, etc). The Triangle's one-stop shop for outdoor living. Peak Pool & Spa specializes in the repair, maintenance and service of your swimming pool and equipment. We have over 15 years of experience, and pride ourselves in delivering the best customer service in the Raleigh area. Jason Jones is the owner and operator of Peak Pool & Spa. Wilson Pools, Spas, & Home Improvement, Inc. Since 1988, Wilson Pools, Spas, & Home Improvement, Inc. has provided residents and business owners throughout Fayetteville, NC with superior services. Our team of licensed and insured contractors will give you the home that you have always dreamed of. From new vinyl siding and vinyl windows to an in-ground pool, we are ready to help. Give us a call today! When it comes to swimming pools and family fun, we have over a decade's worth of experience keeping everyone happy. In Raleigh, Cary, Wake Forest, Apex, North Raleigh, Chapel Hill, Durham and throughout the Triangle, we have an enviable record of helping our residential clients plan and implement their vision. Our pools, spas and water features represent both a major investment in the value of their properties, and the quality of their lives. For commercial clients our dedication is every bit as strong. We've helped design and construct in-ground pools, spas, water features and other aquatic showplaces for fitness centers, private organizations, neighborhood pools, hotels, resorts and more. For over 40 years, Rising Sun Pools has been helping homeowners create their very own backyard oasis. Our family-owned company offers the feel of a small business you can trust, with the resources of a well-established company. Let Rising Sun Pools make your backyard dreams a reality. Liquid Designs is a highly detailed water shape design and build firm located outside of Raleigh, NC. Specializing in unique and creative materials and installations. What is it about Jim Hinson Pools that makes us so unique? Jim Hinson is a licensed North Carolina swimming pool contractor with a style of perfection. With over 30 years of experience, true gunite construction, and a meticulous crew, the end result is nothing less than spectacular. A pool from Jim Hinson Pools ensures a custom built pool, superior construction, and outstanding customer service. Since your needs are always our first priority, we are proud to offer Elysian as a part of our backyard program. We have also been proud receivers of the Merit Award from the American Society of Landscape Architects. At Jim Hinson Pools, we believe that our customers already know what is best for them and should be an active part of the swimming pool process. Therefore we will design with you, not for you. Jim Hinson Pools prides itself on making sure that our customers are comfortable throughout the entire process and that we will meet and beat your expectations. While you are here, make sure that you visit our photo gallery. This will show you not only part and procedure for the construction process but will also give you a few ideas for possibilities with your pool. You can have your own vacation, right in your backyard! We would love to talk to you about what we can do for you. At Jim Hinson Pools, we believe that our customers come first and our designs will be just that for you. 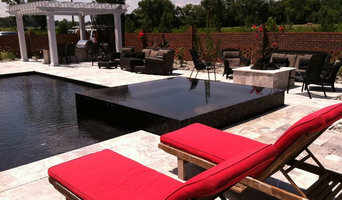 Carolina Creations is a turn key swimming pool and outdoor living contractor. We build concrete and fiberglass pools for both residential and commercial customers. Attention to detail, commitment to quality, and great communication have enabled us to become one of the largest pool builders in our area. A family company, the Cool Pools owners have more than 30 years of experience as licensed general contractors, and in-depth experience in fiberglass swimming pools and excavation. Cool Pools elected dealer of the year in 2009, 2010, 2011, 2012 and 2013 by Custom Fiberglass Pools for outstanding sales and service . We try to make the process as stress free as possible by keeping you up to date and involved throughout the whole installation. From the very beginning when the owners come to your house for a home consultation to when your pool is finished and ready to enjoy, we make sure that we are accessible and available to answer any questions and ease all concerns. Frank Bowman Designs prides itself on providing our clients with individualized service and attention to detail that is unsurpassed in the custom swimming pool or landscape industry. With a strong team of experienced and qualified professionals, including architects, engineers and designers, Frank Bowman Designs has a track record of taking the simplest to the most complex project from dream to reality. Frank meets personally with each client to gather information and survey the site. In creating a plan for the project, Frank will consider the layout of the lot, property lines, elevation, scope, and contour as well as the shape of home and existing hardscape features. Frank will then draw illustrations of the swimming pool, hardscape and landscape plan, providing the client with visual details while at the same time ensuring accuracy and efficiency during project installation. Frank Bowman Designs, an ecoconscious company, has built its solid reputation by installing unique and creative custom swimming pools, hardscapes & landscapes while staying within the client's budget and timeframe. With the ability to provide unique and creative solutions, Frank Bowman Designs has installed warm, inviting and appealing swimming pool & outdoor spaces for hundreds of satisfied clients. Whether you’re in search of a relaxing or dynamic new infinity pool, natural stone & paver patio, new landscaping, outdoor kitchen & fireplace or just an entirely new look for your property-depend on us to beautify and enhance the quality of your surroundings. What exactly do Forest Hills pool builders do? If you are planning for a new pool in Forest Hills, NC, a swimming pool builder will analyze your outdoor space and your aesthetic wishes to determine an appropriate design for your yard, installing it once the plan is developed and approved. Once installed, some pool companies in Forest Hills, NC can handle the necessary cleanings, water testing, renovations and equipment replacement or repairs for your pool or spa. If not, many can also suggest Forest Hills, NC swimming pool contractors or maintenance services to help with upkeep or repairs down the road. Here are some related professionals and vendors to complement the work of swimming pool builders: Garden & Landscape Supplies, Landscape Architects & Landscape Designers, General Contractors, Landscape Contractors, Solar Energy Contractors. Before hiring a swimming pool construction company to create your new Forest Hills, NC pool, determine how you'll be using it. Will it be for fun or for lap exercise? Will the primary users be children, adults or a mix of the two? Knowing the use can help you find Forest Hills pool builders who shares your aesthetic. Once you find swimming pool builders in Forest Hills, NC who share your style, research is critical. Review customer references and comments, collect at least three to four estimates to compare, meet with potential Forest Hills pool designers and builders in person and ensure that they are North Carolina certified service professionals and licensed with the registrar of contractors before making any final decisions. In addition, get a sense whether they plan to complete the pool installation and be done with it, or whether they seem interested in building a long-term relationship with you. Be wary of the former: it's likely a reflection on the level of quality of the pool construction they do. Find a Forest Hills pool contractor or designer on Houzz. 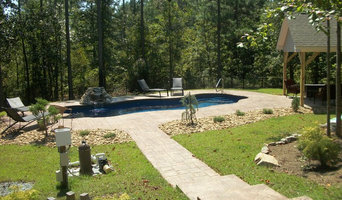 Narrow your search in the Professionals section of the website to pool builders in Forest Hills, NC. You can also look through Forest Hills, NC photos by style to find a pool or spa you like, then contact the local pool company who designed it.